NLQuery is a natural language engine that will answer questions asked in natural language form. Input: Who is Obama married to? Because a labelled dataset for search queries is hard to find and I wanted to see how well my matching library would work. There are finite amount of grammar rules even though there are an infinite amount of queries and we can build a system that matches these rules. It works surprisingly well and is able to handle many different types of queries, however there were some slight hacks I needed to do handle some queries. We can do some simple preprocessing to add punctuation and capitalization to the raw input to make it easier to parse in the next step. 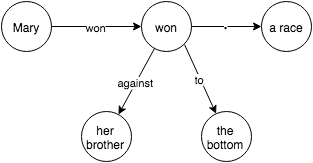 This parse tree represents the grammatical structure of the sentence and from this we can match the grammar rules to extract the context. We can convert the grammar parse tree to context parameters by matching the tree with rules. We can doing this using my library for matching parse trees: Lango. subj_t: "( NP ( NP:subject-o ( NNP ) ( POS ) ) ( NN/NNS:prop-o )"
This grammar rule matches the parse tree and we can extract some context from the corresponding symbols in the rule. We have the subject “Obama”, the property “wife” and the question type “who”. Once we have the contextual parameters of the query, we can construct a SPARQL query to query the WikiData database. Wikidata is a free and open knowledge base that can be read and edited by both humans and bots that stores structured data. It uses a graph database to store the data and has an endpoint for a SPARQL graph query. In the high level, entities are represented as nodes and properties of the entities as edges. Every relationship is stored as a triple e.g. (entity:Q76 property:26 entity:13133). This triple represents the relation that entity:Q76 (Obama) has property:26 (spouse) with entity:13133 (Michelle Obama). So if we are querying for the entity that is Obama’s spouse, we are looking for triple of the form (entity:Q76 property:26 ?x) where ?x the unknown entity we are looking for. The SPARQL syntax is beyond the scope of this blog post and if you are interested, you can learn more about the WikiData SPARQL here. Thus we get the final answer as “Michelle Obama”. What else will you add? This is cool! How can I help? The code is relatively short and simple (~1000 lines with comments) and it should be easy to dive in and make your own pull request! 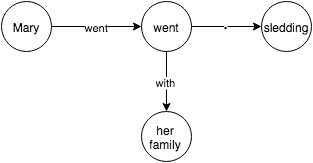 Natural language understanding is defined as “machine reading comprehension”, i.e., a natural language understanding program can read an English sentence and understand the meaning of it. I have found that a shallow level of understanding can be achieved by matching the parse trees of sentences with only a few rules. 1) Use some combination of regexes and conditional statements to match a sentence. I believe option 4 is a cheap, quick easy way to get extract meaning from sentences. Many people will argue it’s not “true” AI, but if you’re making a simple bot and not a AI that can philosophize the meaning of life with you, then this is good approach. Lango is a natural language library I have created for providing tools for natural language processing. Lango contains a method for easily matching constituent bracketed parse trees to make extracting information from parse trees easy. 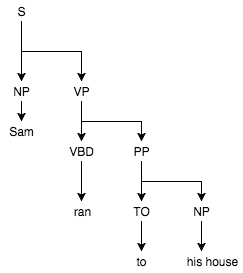 A constituent bracketed parse tree is a parse tree in bracketed form that represents the syntax of a sentence. 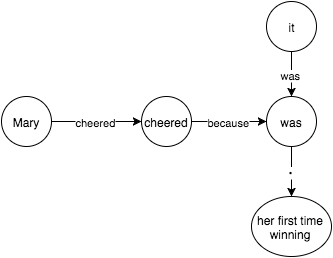 In a parse tree, the leafs are the words and the other nodes are POS (parts of speech) tags. For example, “to” is a word in the sentence and it is a leaf. It’s parent is the part of speech tag TO (which means TO) and its parent is PP (which is pre-propositional phrase). The list of tags can be found here. Suppose we want to match the subject (Sam), the action (ran) and the action to the subject (his house). We use the token “NP:to_object-o” to match the tag NP, label it as ‘to_object’ and “-o” means get the string of the tree instead of the tree object. More explanation of the rule matching syntax/structure can be found on the Github page.